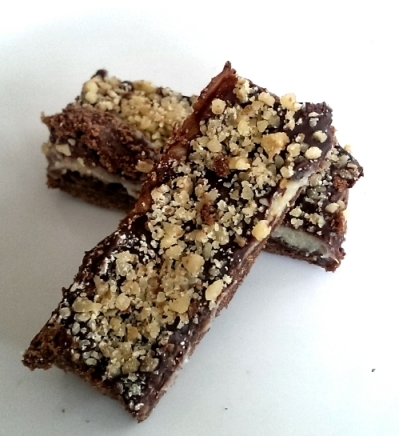 A chocolate lover’s dream, Chocolate Toffee Bars are deceptively elegant but easy to make. They have three layers: a brownie-like base, toffee filling, and a chocolate nut topping. The toffee filling is heated slowly on the stovetop while the brownie layer pre-bakes. Combine all-purpose flour and cocoa powder. Set aside. Set aside 2 tablespoons butter. In a medium bowl, using medium speed with an electric or hand mixer, beat remaining butter and powdered sugar until mixture is light and fluffy. Add flour and cocoa gradually. Mix well. Use floured hand to press mixture into the prepared baking pan. Bake 15 minutes. Meanwhile, in a medium saucepan combine reserved butter and sweetened condensed milk. Cook on low heat, stirring constantly, until mixture thickens slightly, about 15 minutes. Remove from the heat. Stir in vanilla extract. Pour toffee-like mixture over the baked crust. Return the pan to the oven. Bake 10-15 minutes longer or until top is golden brown. Remove pan from the oven. Pour chocolate chips over hot bars. Let the pan stand one minute. Use a spatula to spread chocolate evenly over bars. Once you sprinkle the hot, baked cookie surface with chocolate chips and give them a minute to soften, spread them quickly. If the chocolate has not completely melted, return the baking pan to the warm oven for 30 seconds. The heat will warm the chocolate and allow you to spread it smoothly. Sprinkle the smooth chocolate surface with nuts. Allow pan to cool completely on a wire rack. Cut into bars. Set bars in an airtight container, placing waxed paper in between layers. Store bars in the refrigerator so that chocolate does not melt. As you make the first layer of the Chocolate Toffee Bars, be sure to press the crust evenly into the pan to ensure uniform baking. The recipe can be even richer if you use high-quality cocoa powder, butter, and gourmet chocolate chips.